Just as wingnuts in general think the words "radical Islamic terrorism" hold some mystical power that will CHANGE EVERYTHING if only they were uttered by the president and Hillary Clinton, for some reason gun nuts also think they can put away all criticism of their fetish for semi-automatic weapons by complaining that people writing about guns are using incorrect technical terms for semi-automatic weapons. The anti-gun politimedia wasted no time at all demonizing the most common rifle in the United States as being the real villain of the Islamic terrorist attack on Pulse nightclub in Orlando. The rifle used by the Islamist terrorist in Orlando was not an AR-15. The rifle used by the Islamist terrorist in Orlando was instead a Sig Sauer MCX carbine, a modular, multi-caliber (able to swap to different calibers, including 5.56 NATO, 300 BLK, and 7.62×39) rifle system that sometimes utilizes STANAG magazines common to more than 60 different firearms, but otherwise has no major parts that interface with AR-15s in any way, shape or form. See, it's completely different! Except for the semi-automatic weapon part. In 1963, Colt started selling the semi-automatic version of the M16 rifle as the Colt AR-15 for civilian use and the term has been used to refer to semiautomatic-only versions of the rifle since then. Colt continued to use the AR-15 trademark for its semi-automatic variants (AR-15, AR-15A2) which were marketed to civilian and law-enforcement customers. The original AR-15 was a very lightweight weapon, weighing less than 6 pounds with empty magazine. Later heavy-barrel versions of the civilian AR-15 can weigh upwards of 8.5 lb. Today, the AR-15 and its variations are manufactured by many companies and are popular among civilian shooters and law enforcement forces around the world due to their accuracy and modularity (for more history on the development and evolution of the AR-15 and derivatives see M16 rifle). The trademark "AR15" or "AR-15" is registered to Colt Industries, which maintains that the term should only be used to refer to their products. 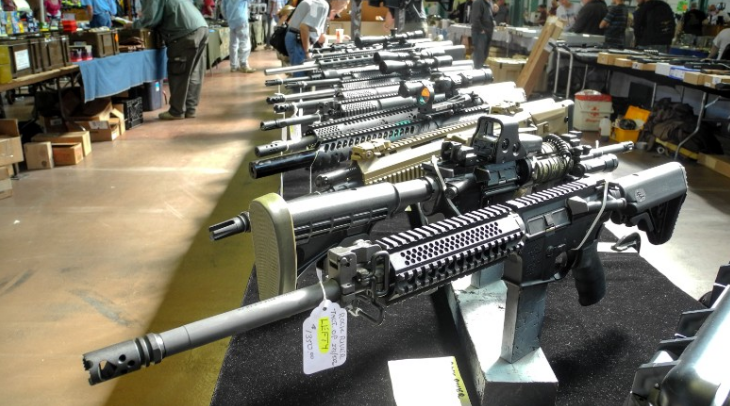 Other AR-15 manufacturers make AR-15 clones marketed under separate designations, although colloquially these are sometimes referred to by the term AR-15. It's a colloquial brand name, like Kleenex or Coke. This pedantic nit-pick is just another sign that their greater argument is thin and unconvincing. But it's all they've got. It's a lethal toy for gun nuts that serves no other purpose than to mow down many human beings very quickly.